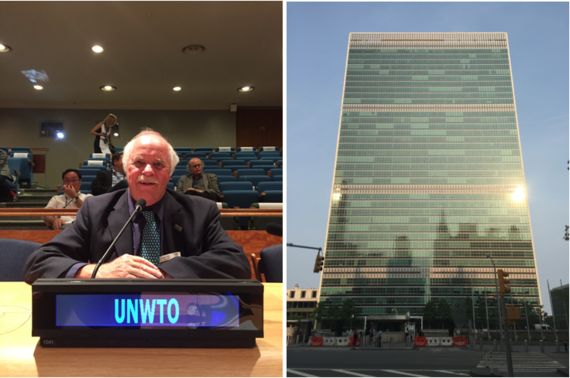 This week, I had the opportunity to attend the United Nations High Level Political Forum on sustainable development (HLPF) as a guest of the UNWTO. The HLPF on sustainable development is the main United Nations platform on sustainable development. It provides political leadership, guidance and recommendations. It follows up and reviews the implementation of sustainable development commitments. It addresses new and emerging challenges; promotes the science-policy interface and enhances the integration of economic, social and environmental dimensions of sustainable development. 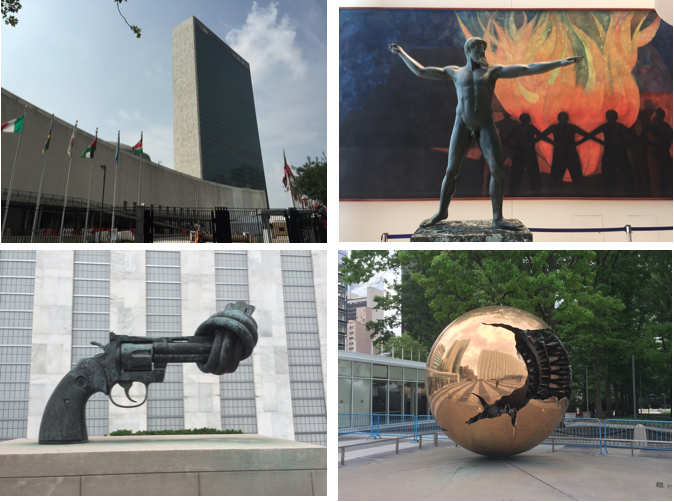 The HLPF meets every four years at the level of Heads of State and Government under the auspices of the General Assembly and every year under the auspices of the Economic and Social Council. The meeting focused on the proposed 17 Sustainable Deveopment Goals (SDG's) that will replace the expiring Millennium Development Goals (MDG's) this fall. 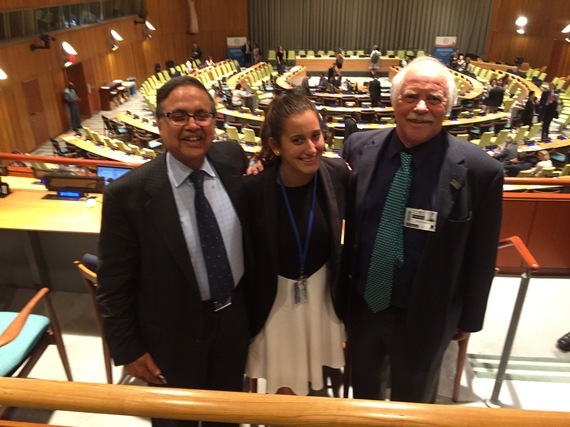 Ambassador Sarbuland Khan, arranged for me to make a statement as part of the UNWTO delegation to the HLPF. 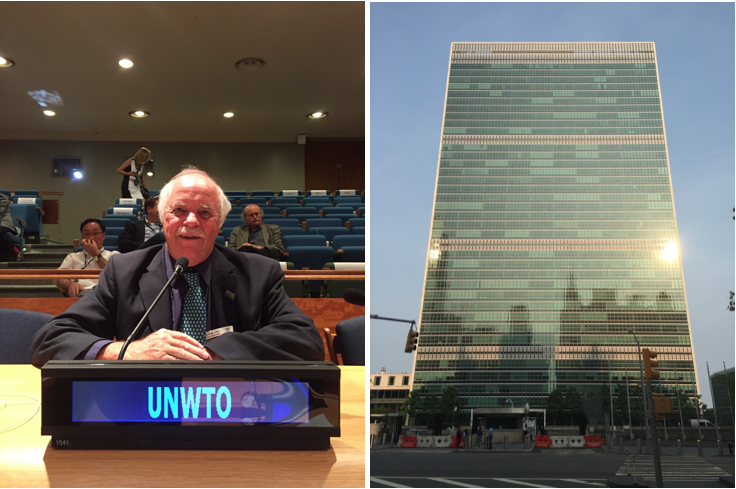 My statement was directed to the role that sustainable tourism can play in implementing the SDG's. I began my presentation by asking the Excellencies, distinguished delegates and ladies and gentlemen to imagine: What if? What if there was an industry economically as powerful as 9 percent of the world's GDP, for SDG implementation? What if this industry had a demonstrated process to better feed the world's hungry through promoting sustainable agriculture so that 50 percent of all food was sourced locally, and waste was diverted to the poor, used for compost for farmers or as an energy source? What if this industry actually required a healthy environment to succeed? What if this industry found it is in its best interest to assist people to reconnect with nature and inspire them to take action to protect the Earth? What if this industry already had in its own code of ethics to promote gender equality? What if this industry would lose its customers if it did not provide safe water and sanitation? What if affordable and reliable energy were necessary to doing business? What if safe and resilient environments were necessary for selling it's product? What if this industry was the best chance for development in several LDC's? What if this industry already has demonstrated the capability to change production and consumption patterns, to reduce waste to land fill over 50 percent in just three years? What if this industry has already demonstrated the capability of reducing net carbon emissions 50 percent in five years while at the same time increasing profits? What if this industry was driven by the values of preserving the land, air and water, while operating safely within planetary boundaries as critical for sustaining its business and increasing profits? What if this industry had built into it a feature that promoted world peace and cultural understanding? By now you probably realize that such an industry exists. It is called Sustainable Tourism. In Goal 8:9 it states: "by 2030 devise and implement policies to promote sustainable tourism which creates jobs, promotes local culture and products". In Goal 12.b it states "Develop and implement tools to monitor sustainable development impacts for sustainable tourism that creates jobs and promotes local culture and product"
While sustainable tourism has been identified in these two goals, it actually encompasses all of the SDG's. Sustainable tourism has already provided the world, through its best practices, concrete practical models for implementation. It has been said every crisis is a danger and opportunity. Sustainable Tourism is an incredible opportunity for nations to organize around for successful implementation of the SDG's. I hope you and your respective nations will take full advantage of this opportunity. 1. End poverty in all its forms everywhere - Tourism accounts for 9 percent of the worlds's GDP, as much as 12.5 percent of the work force, and in some nations as much as 70 percent of the economy. 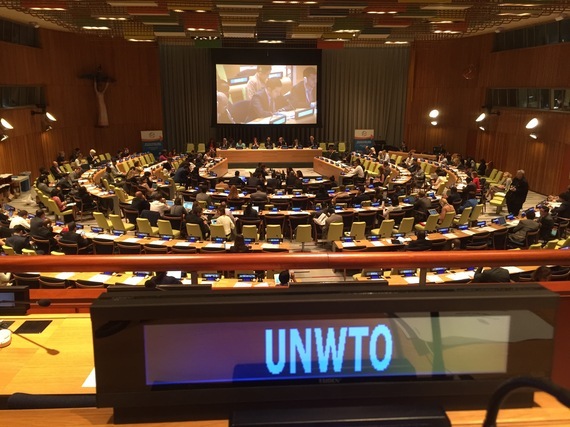 As the UNTWO has noted http://step.unwto.org/en/content/tourism-and-poverty-alleviation-1, "Tourism is one of the strongest drivers of world trade and prosperity. Poverty alleviation is one of the greatest global challenges. Despite turbulent times for the world's economy, these basic facts are unlikely to change. Focusing the wealth creating power of tourism on people most in need remains an immense task and opportunity"
2. End hunger, achieve food security and improved nutrition and promote sustainable agriculture - The tourism industry is already moving to source more of its food locally and sustainably. This involves increasing local food production through such means as hydroponic farming, sustainable fishing practices, new partnerships with local farmers. Food waste is also being reduced by tourism programs that feed the hungry and turn waste into compost and energy. For example Walt Disney World provides 704,845 pounds of food to feed the hungry in three different Florida counties. Disney also produces about 11,000 tons of compost each year, most of which is given to farmers. The Chiles Restaurant Group in Anna Maria Island, Florida, have developed a global model promoting sustainable agriculture. This model integrates organic and hydroponic farming, sustainable seafood, utilization of invasive species for menu items, composting from food waste and now is exploring turning other food waste into energy. 3. Ensure healthy lives and promote well-being for all at all ages - Tourism resorts and destinations require healthy environments to attract visitors. In addition tourism often promotes healthy lifestyle practices particularly related to exercise, stress management and safety. In some tourist communities, the tourism industry provides the resources for health clinics, hospitals and other health care services. 4. Ensure inclusive and equitable quality education and promote lifelong learning opportunities for all - The tourism Industry can be a valuable partner to improve education. A good example is the Walt Disney Company that reaches 2000 classrooms through its Planet Challenge and the curriculum program that Disney Cruise Lines developed with local class rooms in the Bahamas, including experiential environmental education at Castaway Cay. 5. Achieve gender equality and empower all women and girls - Women make up the majority of the tourism workforce. The UNWTO Code of Global Ethics for tourism calls for gender equality which provides a strong foundation for this SDG. One example of how tourism has empowered women is the the United Women Artisans' Association of Los Limites, Columbia that received the UN Equator Award for empowering unemployed women to save the Cotton Top Tamarin Monkey. 6. Ensure availability and sustainable management of water and sanitation for all - Tourism if developed sustainably brings improved water and sanitation to a local area. Tourism unlike other businesses has incentive to provide safe water and sanitation to both attract visitors and encourage them to return. Some good examples of this best practice are Coconut Bay, St. Lucia, which installed two 8,000 gallon tanks to lessen community impact, the white roof water collection in Bermuda and their cap on tourism units and the Disney water conservation which has kept net aquifer levels the same for past 22 years and who meets 30 percent of resort needs and 80 percent of irrigation needs are met by reclaimed water. 7. Ensure access to affordable, reliable, sustainable and modern energy for all - Tourism has incentive to utilize renewable energy and provide reliable energy for their guests. The consequences of not doing so can seriously impact the business. Some best practices include Tiamo Resort in the Bahamas that provides 100 percent of its energy through solar and Paradise Villas in Grenada that produces 150 percent more renewable energy with wind and solar that it uses thus contributing to the energy needs of the larger community. 9. Build resilient infrastructure, promote inclusive and sustainable industrialization and foster innovation - Tourism demands safe cities and communities for its visitors if it is going to be successful in both attracting visitors and having them return again. The Walt Disney Company has become a living model for developing more sustainable cities particularly with its infrastructure for water, energy, waste management and transportation. 10. Reduce inequality within and among countries - Sustainable tourism can be one of the best choices for improving a LDC's GDP by bringing more money into the economy. As David Scowsill, President & CEO WTTC, said: "At a time of global economic challenges, Travel & Tourism continues to grow faster than the global economy, and is an enduring source of job creation and a driver of growth for every region in the world. Our annual research demonstrates that the sector has recorded strong economic growth in 19 out of the last 20 years, providing much-needed economic stability at a time of global economic volatility." 11. Make cities and human settlements inclusive, safe, resilient and sustainable - Tourism relies on safe cities to both attract and bring back visitors. Tourism has also realized that the more sustainable and resilient destinations are, the more likely they are to succeed in the tourism business. Xanadu Resort in Belize for example built the resort using monolithic dome construction which enabled it to weather Hurricane Keith, keeping all its guests and employees safe while the surrounding areas was devastated. 12. Ensure sustainable consumption and production patterns - Sustainable tourism promotes sustainable production and consumption patterns. For example the Walt Disney Company has set a goal to reduce its waste to landfills to zero. In three years they have successfully reduced their waste 58 percent and are now working to be zero. Much of this reduction was achieved through better supply chain management. Tourism also promotes healthy lifestyles encouraging outdoor activities, and relaxation. In addition tourism has become a leader in reducing toxic chemicals. The Disney Animal Kingdom for example uses zero toxic chemicals in their theme park which is visited by about 30,000 people per day. 13. Take urgent action to combat climate change and its impacts* - Tourism has provided significant leadership in combating climate change. For example the Walt Disney Company has set a goal to become a zero net carbon company, has reduced its net carbon emissions 50 percent between 2008 and 2012, and set a goal to reduce it 50 percent again by 2020. 14. Conserve and sustainably use the oceans, seas and marine resources for sustainable development - Much of tourism is located on or near the oceans. Fishing, boating, diving, snorkeling and cruise lines are all examples of tourist operations that depend on healthy oceans, coastal habitat and marine environments. The Blue Community program has been actively engaged in tourism programs to protect the oceans and coastal habitat and marine environments. 15. Protect, restore and promote sustainable use of terrestrial ecosystems, sustainably manage forests, combat desertification and halt and reverse land degradation and halt biodiversity loss - Unlike many industries, tourism has a vested interest in preserving the air, water, forests and biodiversity of the area. This is what attracts people in the first place to visit and from which experiences they return. The Walt Disney Company has been a leader in ecosystem protection and restoration through the Disney Conservation Fund, and projects such as the Disney Wilderness Preserve that is a global model for public private partnerships in resorting and preserving wetlands. 16. Promote peaceful and inclusive societies for sustainable development, provide access to justice for all and build effective, accountable and inclusive institutions at all levels - The global citizen and author Mark Twain once said "Travel is fatal to prejudice, bigotry and narrow-mindedness, and many of our people need it sorely on these accounts. Broad, wholesome, charitable views of men and things cannot be acquired by vegetating in one little corner of the earth all one's lifetime." Tourism can help create better understanding of different cultures and traditions and at times engage in track II diplomacy. The International Institute For Peace Through Tourism is a good example of how tourism is working to support peace. 17. Strengthen the means of implementation and revitalize the global partnership for sustainable development - Though organizations such as the Global Sustainable Tourism Council, The International Ecotourism Society, and the UNTWO International Network for Sustainable Observatories, tourism is strengthening global partnerships to revitalize sustainable development. 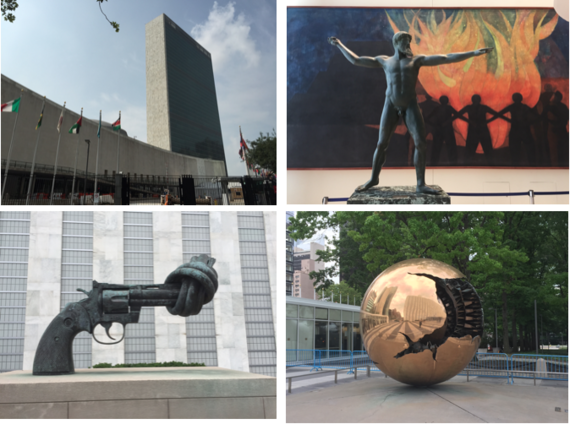 In summary, the UN Sustainable Development Goals provide new hope an promise for a planet in need of changing course toward sustainable development. Tourism can do much to both show the way and assist others to follow the path.